First of all, congratulations on your interview! No doubt your preparation is now in full swing – researching the organisation and preparing your answers to common interview questions, as well as anticipating those that might come from left field. And whilst, of course, your performance in the interview room is hugely important (and thorough preparation will have a huge bearing on that), it’s also crucial that you use this time to assess, for yourself, whether this employer really is right for you. Increasingly, more and more candidates are realising the importance of working for an employer that is committed to diversity and inclusion (D&I). In fact, almost one in five (18%) of respondents to a recent Glassdoor survey cited a commitment to diversity and inclusion as among the most important factors in their decision to join their organisation. Sounds obvious, right? It is – but unfortunately, it can be really challenging to build a full and honest picture of how (extensively), in reality, a given employer focuses on building a diverse workforce and fostering an inclusive workplace, until you actually work there. 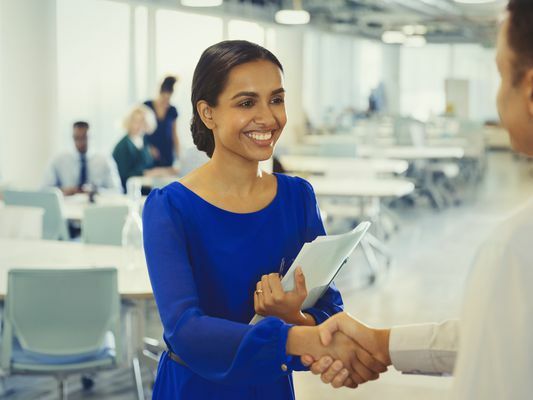 However, there are some signs you can and should look out for, both when conducting your pre-interview research, and during the interview process itself – this is what I want to share with you in this blog. Clues in the job description: What sort of language is used in their advertisement, and the promotional documents you have received so far? Have they used any gender-biased language? Research by Textiofound that certain words are proven to appeal to either men or women. In fact, the word ‘proven’ is one of them, and is strongly linked to jobs that resulted in a male hire. Intriguingly, Textio also found that job postings that applied gender-neutral language were filled in less time, and attract a more diverse mix of people. Research the organisation’s website for evidence: You may be able to establish key factors in defining how important diversity and inclusion is to the business by researching their website. For instance, they may have already published a specific ‘diversity and inclusion’ policy document or alluded to shared examples of their commitment to ‘D&I’ in their company values or mission statement. You may also come across specific reports which are required to be made public by law on their website. In relatively recent times, there’s been an increased impetus in many countries for organisations to publish data around diversity and inclusion. For example, in the UK, by law, companies, charities and public-sector departments with 250 employees or more must publish their gender pay gap figures every year – this reporting will be available via their websites. Lastly, have they won any awards or received recognition for this? As above, the language that they use on their website could also indicate their position and commitment. Glassdoor reviews and social media channels: As many as 70% of people now look to a review site before making a decision on their career, but this should never be your only source of information. If you do research a new employer online, you should bear in mind that no Glassdoor review is perfect, and the scores can often be polarised as either very positive or very negative. However, by also looking at a company’s social media channels, you can get an idea of the community within that organisation. Do you see evidence of teambuilding activities or charitable events on Facebook or Instagram? Do managers engage with or share employees’ content on LinkedIn? Do they seem proud of what they do and who they work with, and is there a company #hashtag that shows this? If you search #WeareHays on Instagram, for example, you’ll see what we do – does the company you are considering proudly promote an equivalent? What do their benefits packages suggest about them? Have you already been attracted by the flexible working conditions the company offers? Do they have a shared parental leave policy? Akin to looking closely at the language they use on their website and in the application materials, you can identify whether specific employee benefits are suited for everyone or will work better for certain individuals. You may also be able to ascertain whether they have a regular internal programme of engaging with the likes of Pride events and International Women’s Day or celebrating cultural diversity. Is there diversity within the board of directors? If you find that the organisation is predominantly run by men or women or people of a certain ethnicity, this isn’t necessarily a red flag that diversity and inclusion doesn’t exist within the organisation, but it could give you something to think about during the interview. What do they as leaders of the organisation do to promote diversity and inclusivity, both internally and externally? While there are certainly many areas you can investigate before the interview itself, I would urge you not to rule out an employer just because you don’t find any overwhelming evidence of their commitment, and they aren’t ticking every single box. Diversity within the interview panel itself and a subsequent ‘walk around’: Who are you introduced to when you walk into the interview room or in a subsequent ‘walk around’? Are you greeted by a combination of men and women, perhaps of varying age and ethnicity, with differing personality types and perhaps a visible disability. Although you won’t be able to identify every type of diversity in your short time being interviewed, if your perception of the panel and initial workplace ‘optics’ is that diversity exists here, then it could be a fair reflection of the organisation as a whole. Inclusive communication at all levels: What is the dynamic between the panel members themselves and also with others? Have you been able to hear any of these panellists talking to staff outside the interview room, such as receptionists or administrators? The respect that members of the interview panel give to themselves and others could be indicative of how they treat one another on a day-to-day basis. A conversational interview throughout: Does the interview feel like a two-way process? Do you feel as though you are engaged in a conversation, as opposed to locked into an interrogation? Are you being asked questions that enquire about and capture the spirit of what you want from your career and what would be seeking from an employer like them in order to realise your potential? Do you feel that your answers are really being listened and responded to? How the interview panel communicates with you can be a strong indicator of how highly the company values inclusion. Ask questions that probe their culture and ethos: This is the point when you can enquire about specific internal groups, resources or initiatives, or how the organisation came to win certain diversity related awards that you found out about that particularly resonated with you during your research. You could also directly ask the interviewers why they think diversity and inclusion is important, how they build an inclusive culture and other questions that probe their policy and the progress they are actually making. Perhaps ask the same question to more than one interviewer to see if they have more than one example to share with you. Crucially, if the organisation has made a meaningful commitment to diversity and inclusion, then each of the interviewers should be able to give their own interpretation of how the organisation has gone about it. To sum up, through thorough pre-interview research, together with looking out for the above four factors during the interview itself, you will be able to build a real sense of the employer’s genuine commitment to building a diverse workforce and an inclusive culture. And in turn, importantly, how they will welcome you, and all the unique differences you will bring into their organisation.